Friday, 14th September is our viewing date this month, 7.00 p.m. at Pedro Castle. 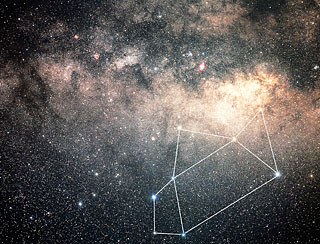 Sagittarius, the archer — whose brightest stars form the shape of a teapot — is now prominent in the southern sky. Sagittarius has drawn his bow, and his arrow is pointing at Antares, the bright red heart of Scorpius, the scorpion. The archer is avenging Orion, who was slain by the scorpion's sting. The constellation Sagittarius is one of the most interesting regions of the sky. The center of our Milky Way galaxy lies inside Sagittarius, about 26,000 light-years away. The constellation also contains several globular clusters — tightly packed collections of hundreds of thousands of stars. The Milky Way is the galaxy where the Solar System (and Earth) is located. It is a barred spiral galaxy of a Local Group of galaxies within the Virgo Supercluster. The main disk of the galaxy is about 80,000 to 100,000 light-years in diameter, about 250,000 to 300,000 light-years in circumference, and outside the Galactic core, about 2,300–2,600 light-years in thickness. The galaxy is estimated to contain 200 billion stars but this number may be as high as 400 billion if small-mass stars predominate. As a guide to the relative physical scale of the Milky Way, if the galaxy were reduced to 130 km (80 mi) in diameter, the solar system would be a mere 2 mm (0.08 inches) in width. The Lagoon Nebula (also known as Messier Object 8 (M8) and NGC 6523) and the Trifid Nebula (also known as Messier 20 and NGC 6514) are giant interstellar clouds and H II regions. An H II region is a cloud of glowing gas and plasma, sometimes several hundred light-years across, in which star formation is taking place. Young, hot, blue stars which have formed from the gas emit copious amounts of ultraviolet light, ionising the nebula surrounding them. Nunki, 224 light years away from us, is the second brightest star in the constellation Sagittarius; its Babylonian name is of unknown origin. Blue-white Nunki is a B star and one of the hotter of the bright stars, radiating much of its light in the ultraviolet. Typical of its breed, it is a fast spinner, rotating with a speed of over 200 km/s – 100 times that of our Sun. Although still on the main sequence, Nunki is much more massive than the Sun and will exhaust its internal fusion reserves in another 50 million years or so. Jupiter is the only planet visible in the evening sky, brilliant and unmistakable in Scorpius, above Antares. Early risers will be able to see Mars overhead before the dawn, and Venus and Saturn in the east.